Dr. Dallas Reed, an obstetrician-gynecologist and medical geneticist, uses a new software program to help diagnose kids with rare genetic diseases. Dr. Olaf Bodamer wasn’t sure what was wrong with the 3-year-old boy he recently examined at Boston Children’s Hospital, but he had a hunch. The child’s muscle tone was weak, and he had taken longer than expected to start walking and talking. He also had unusual facial features: a cleft palate, arched eyebrows, and large, misshaped ears. Bodamer, a 55-year-old clinical geneticist, suspected Kabuki syndrome, a rare genetic disorder. Children with the condition have distinctive features that Japanese doctors, who first identified it in 1981, likened to the makeup worn by actors in kabuki theater. But patients also typically have a flattened nose. This boy didn’t. So Bodamer did something a growing number of specialists in genetic disorders are trying. He took a photograph of the toddler’s face on his iPad and uploaded it to a facial recognition app called Face2Gene, developed by Boston-based digital health startup FDNA. Within seconds, the software indicated that, based on the picture and symptoms Bodamer checked off, his suspicion was probably right: Kabuki was the most likely diagnosis. Bodamer took a blood sample from the boy, sent it to a lab for genetic testing, and a few weeks later received confirmation — one of two genes in the patient’s DNA had the mutation that causes Kabuki. “It’s a useful physician support tool that clearly has its place in the diagnostic process,” Bodamer, associate chief of genetics and genomics at Children’s Hospital, said of Face2Gene. He and a staff of nine other medical geneticists at the hospital use it just about every day, he said. Bodamer got the mobile app in April 2016 and was so impressed that a few months later he agreed to serve on FDNA’s scientific advisory board. Bodamer said he receives no money in the advisory role. Of the more than 7,000 known rare diseases, up to half are believed to cause changes to the shape of the face or skull. Down syndrome is the best known and most common chromosomal disorder. Many conditions are obscure, making them challenging for even the most seasoned specialist to pinpoint. Experts say it typically takes parents of children with rare genetic diseases roughly seven years to get the correct diagnosis. That’s why FDNA created Face2Gene. Founded in 2011 by two Israeli entrepreneurs around the same time they sold a facial tagging system to Facebook for $70 million to $80 million, the firm designed the software to more quickly point medical geneticists in the right direction. 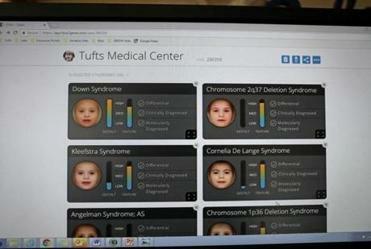 Face2Gene was developed by Boston-based digital health startup FDNA. In 2014, medical geneticists around the world began using the app, uploading pictures of patients. Through crowdsourcing and artificial intelligence, the software ranks the 10 most likely causes of a genetic disorder on the basis of facial patterns — what the app calls the “gestalt.” Doctors help the technology narrow down potential diagnoses by uploading the patient’s symptoms to the app. “When you talk to these geneticists and they see a patient, they’ll say, ‘It looks like Cohen syndrome, it looks like Rubinstein-Taybi syndrome’ — they have this feeling,” said Dekel Gelbman, 40, an Israeli-born former corporate lawyer who serves as FDNA’s chief executive. “This is the instinct that they’ve developed based on years of experience. But they still use our technology. Because we can quantify” the likelihood of the diagnosis, he said. Face2Gene, he added, is the only mobile app of its kind on the market. About 70 percent of the world’s roughly 8,000 medical geneticists use the software, which FDNA provides to them free, and more than 120,000 patients are now in the database, according to Gelbman. With the pace of uploaded pictures increasing, he added, the database likely will have 1 million patients worldwide in two to three years. Gelbman said his firm hopes to generate revenue by licensing the technology to a variety of companies, including drug makers. A pharmaceutical company might use it to identify patients suitable to participate in clinical trials of experimental medicines. 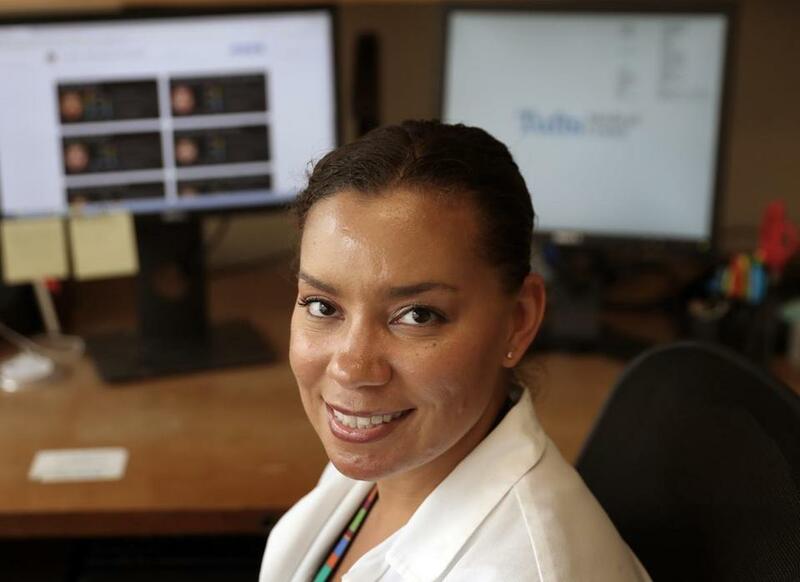 Among the physicians who find Face2Gene useful is Dr. Dallas Reed, a 35-year-old obstetrician-gynecologist at Tufts Medical Center who spends about half her time as a medical geneticist. Reed recently used the app in the case of a newborn girl. Another ob-gyn had treated the mother during pregnancy and advised the woman that, based on the results of prenatal ultrasound tests, her daughter would likely be born with multiple internal organ defects. Nonetheless, the newborn had an unexpected appearance in the neonatal intensive care unit, including large, coarse features, and a squarish face, Reed recalled. She took a picture and uploaded it to Face2Gene. In an instant, the website identified Fryns syndrome, a rare condition Reed had never seen in a patient, as among the most probable reasons for the baby’s appearance. The most common symptom of Fryns — a genetic disorder that affects many parts of the body — is a hole in the diaphragm that allows the stomach and intestines to move into the chest and crowd the heart and lungs. Most children with the condition die before birth or in early infancy. Reed relayed the information from Face2Gene to a genetics testing laboratory, which analyzed a blood sample from the girl and confirmed that she had Fryns. It would have taken longer and cost more for the laboratory to sequence the girl’s genome and identify her illness without first knowing what the software found. Unfortunately, the girl died days after being discharged from the hospital, Reed said, but her parents still appreciated knowing what the baby had. “In my experience, even when we make a diagnosis of something that’s terminal, families are comforted to know that there’s a reason for what’s happening and that everyone’s still not guessing,” Reed said. The parents also learned that Fryns is inherited and that there was a 1 in 4 chance that another child they conceived would have the disorder. As useful as Face2Gene appears to be, even doctors enthusiastic about it say the technology isn’t perfect. Dr. Maximilian Muenke, chief of the medical genetics branch of the National Institutes of Health, said the database, like medical genetics textbooks, mostly features photos of white children of northern European descent. That’s largely because there are fewer medical geneticists in parts of Africa, Latin America, and Asia. It’s critical that children from those regions are included, he said, because genetic disorders can affect their facial features differently than the conditions do in kids of European descent. Gelbman acknowledged that children from North America and Western Europe originally made up most of the Face2Gene database. But he said the company has contacted clinical geneticists around the world who have uploaded pictures, and now less than half of the children are white. The CEO said he’s exploring the idea of expanding the database to include more than pictures of faces — genetic disorders also can affect the skeleton, hands, feet. He even talks about including video and voice recordings.